The ferry to Amsterdam sails from Newcastle in the UK and connects England to Holland. Currently DFDS operate this overnight ferry crossing in both directions. The average price this month is £350 for a car and two people on a return journey and includes an en suite cabin. There are up to 7 sailings every week. The crossing time is from 15 hours and 30 minutes depending on the sailing you choose. 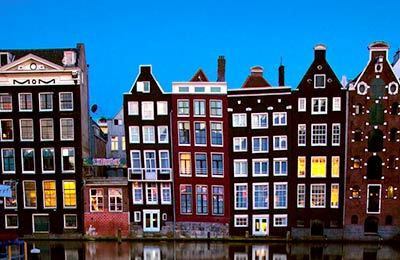 When you do a search for a Newcastle to Amsterdam ferry, we will also compare ferries from Hull to Rotterdam and ferries from Harwich in Essex to the Hook of Holland. 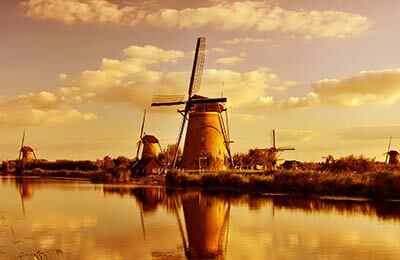 And of course we show you a huge variety of times and prices so you can get our best deal for your Amsterdam ferry. You will find all DFDS ferries offer the highest standards of comfort and all the onboard facilities you could possibly dream of. Including 4 bars, comfortable lounges and 2 restaurants with an all-you-can-eat buffet and an à la carte option too. This Comfort Class cabin accommodates up to two people. It is situated on the inside of the ship and does not have a window or porthole. This standard cabin accommodates up to two people. It is situated on the inside of the ship and there is no window. This Comfort Class cabin accommodates up to two people. It is situated on the outside of the ship and has a sea view. This Commodore De Luxe Cabin offers the height of comfort and style for up to two people. This standard cabin accommodates up to two people. It is situated below the car decks and there is no window. This is several decks away from the main entertainment deck however there are connecting lifts and stairs. This standard cabin accommodates up to four people. It is situated on the inside of the ship and there is no window. This Comfort Class cabin accommodates up to four people. It is situated on the outside of the ship and has a sea view.